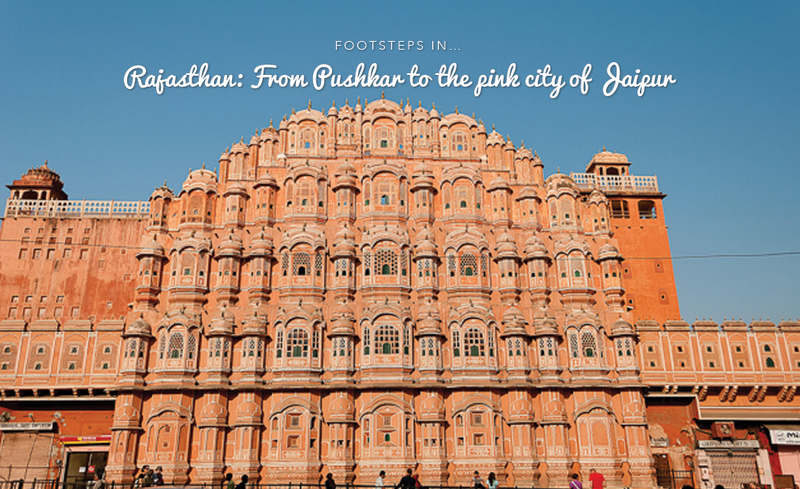 We leave the blue city of Jodhpur to spend the next two nights of our footsteps in Rajasthan in the pink city of Jaipur, the start of the famous “Golden Triangle” of India – Jaipur, Agra and Delhi. We have left the hills and valleys and are now driving along a busy highway, in our tata indica, hurtling towards our first stop, Ajmer. We were meant to stop in at the Darbah (which is one of India’s most important muslim pilgrimage sites) but we happen to arrive in the middle of a religious day and it is impossible to get in to the Darbah. 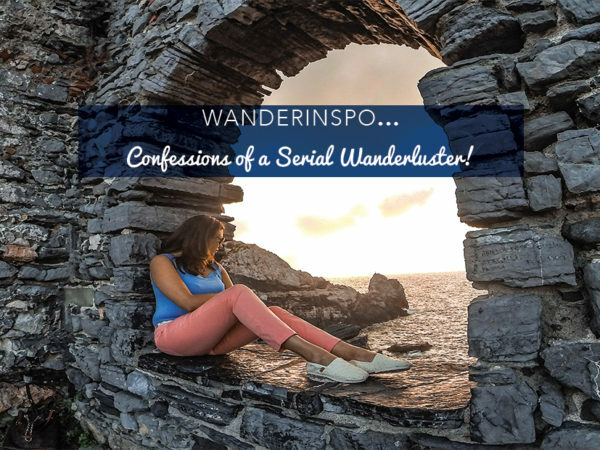 So we request our driver to take us across Nag Pahar (snake mountain) to the mystical town of Pushkar, our interest in the town being incited by our Lonely Planet guidebook. Pushkar is said to have one of the only Brahma Temples in the world.The temple is small, and you have to walk to it in the filthy streets of Pushkar barefoot. There are no cameras allowed however our guide seemed to know where we could deposit our shoes and cameras. The temple has a hose pipe running down its steps which make it wet, and rather uncomfortably slimy. Still, it was somewhat auspicious to be able to pay our respects at one of the only Brahmin temples in the world so we just trudged on. 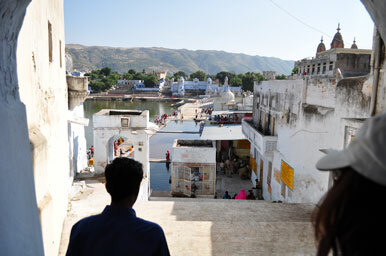 Pushkar is also famous for its Ghats, which allow pilgrims to come and bathe in the sacred waters to cleanse themselves. 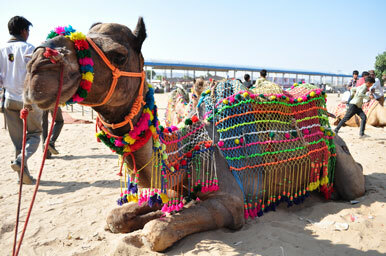 Just our luck, we arrived in Pushkar in time for its annual Camel Festival. 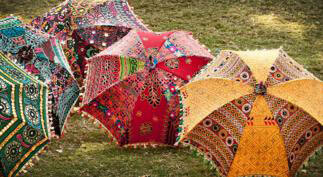 The plains are awash with thousands and thousands of camels, all groomed up with colourful corn rows and pompoms. The fun fair atmosphere, the candy and snack sellers and vendors are abundant, making the most of the festival, with music booming from loudspeakers everywhere. Perhaps the detour was meant to be! Hungry and filthy from the jaunt we head to the newly built Ananta spa to wash up and indulge in a cold Bacardi Breezer and some food. Times like this I wish I drank beer, a cold lager would have been the perfect thirst quencher, or so I imagine. 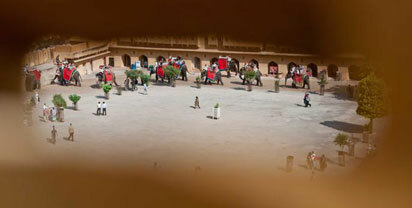 Jaipur is still hours away so we have to make tracks, getting to our hotel, The Sheraton before dusk. It is nice to be able to check in to a luxurious room (still not The Leela though but much better than The Gateway) and have a hot shower and wash off the dirt from our jaunt in Pushkar, and then head back out to the town a restaurant to sample some Indo-Chinese food! 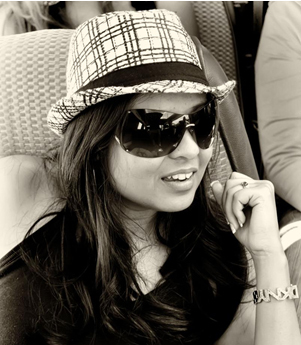 Day 2 in Jaipur and we have a pretty packed and exciting day ahead of us. 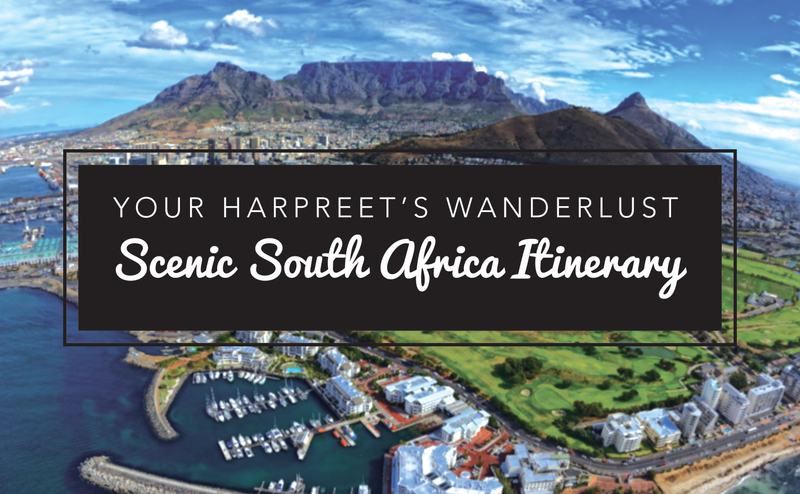 Sated with multi-grain dosas from the sumptuous breakfast spread at The Sheraton, we start off the day by passing through the now restored Chandpol gate, driving through the Old City en route to Hawa Mahal and the Amber Fort. 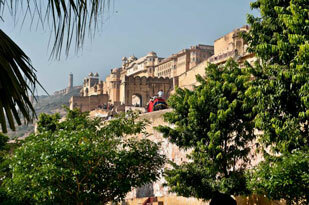 The whole of Jaipur is not pink – just the Old City, which is neatly organised in avenues in rectangle, with each avenue specialising in a special craft. The early morning sun bathes the pink building with its rays, giving the Old City a beautiful glow. 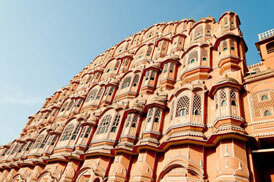 Hawa Mahal is a honeycomb like structure in the Old City, specifically constructed to allow the royal ladies of the yesteryears to peek out through its lattice windows and watch the world go by outside. The lattice like windows become a common feature in all royal palaces. 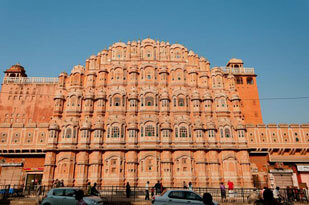 I step out of the car to photograph this stunning building, and I do not even notice that I am going to bump straight into 3 men sitting in front of the palace who happen to be….snake charmers, ugg, the bane of my trek in Rajasthan. Thanks to M I make a hasty retreat, and just in time, too because to my horror one of the pesky snakes escapes from its basket! Luckily I am safely back in our car by then. Shivers. 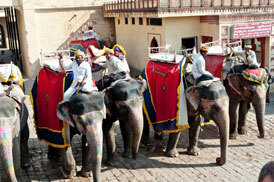 Our guide tells us that each elephant can only go up and down the hill a couple of times and that we would be lucky to ride one, but the queue moves fast and eventually, we do get to ride our elephant up to the main entrance of the fort. 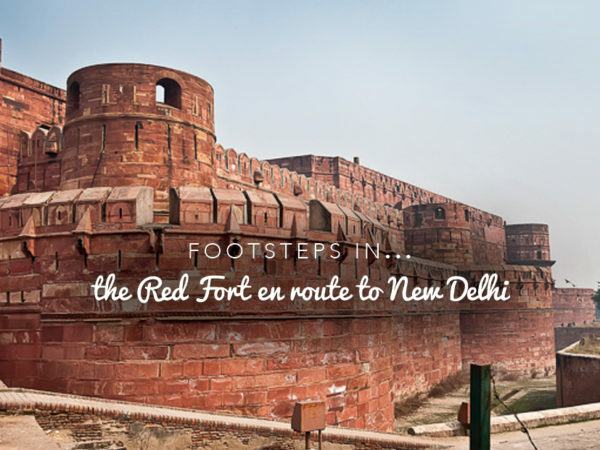 The fort, with its honey coloured walls is humongous. We start off with viewing the Audience Hall and make our way to the Jai Mandir, where the ceiling is intricately in laid with mirrors. The zenana area (where the ladies were secluded) is decked out with fountains. 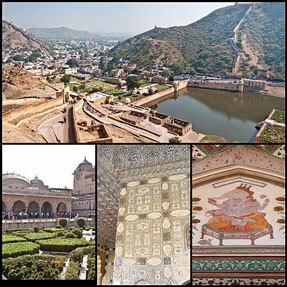 The fort is sprawled out over a large area, and we eventually make our way up to the very top, where the view of the rolling hills and Jaipur surrounding the fort and the beautiful gardens below remain etched in my mind. 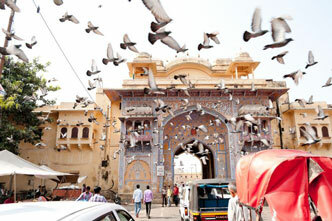 The City Palace is our next stop, situated near the Old City. 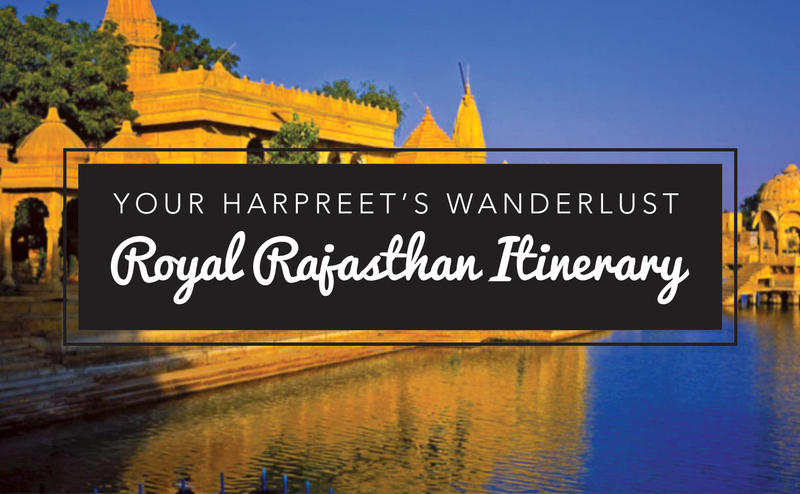 The architecture of the City Palace is stunning – it has the signature latticed windows of all Rajasthani palaces, and is airy and open. 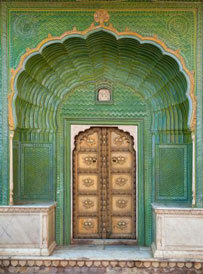 The City Palace is the home of the current maharani of Jaipur, however this is closed off to the public. 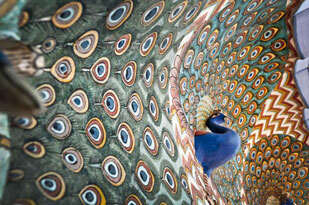 We start off with viewing exhibits of the Maharaja’s finery and their weaponry, in the Hall of Audience. Moving on to the Hall of Private Audience, we see that it is flanked with two silver vessels, said to be the largest of their kind in the world. Surprisingly, the Hall of Private Audience is rather open but has a serenity about it that I just cannot fathom. 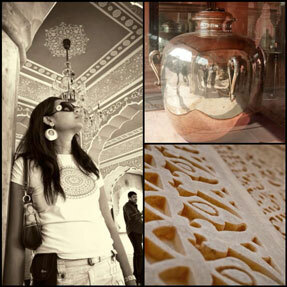 My favourite quarter in the City Palace is the courtyard, known as Pitam Niwas Chowk. This courtyard represents the seasons, and its gates are painted with intricate, colourful yet delicate bas reliefs of peacocks. You just cannot escape the pesky snake charmers who seem to be around every street corner in Jaipur…I think I got lucky in Jodhpur! Indeed, there are a few sitting around outside the City Palace, but I have learned to identify the music and hastily change my direction. Phew. 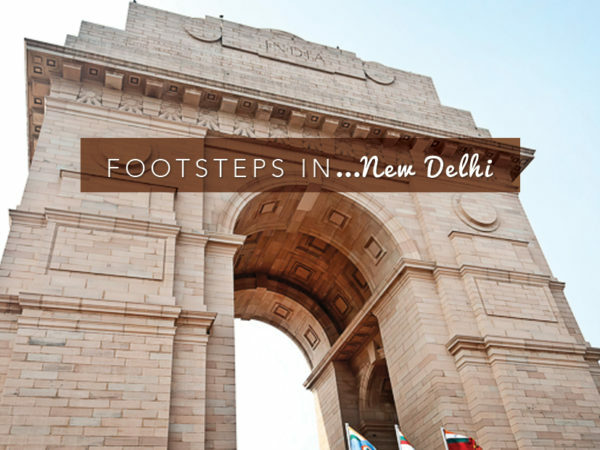 Onwards to Jantar Mantar, Maharaja Jai Singh’s personal playground to pursue his passion for astronomy. 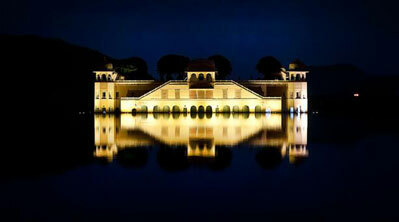 This is now a UNESCO World Heritage Site, as being one of the world’s largest and best preserved observatories. When stepping into Jantar Mantar, you are almost in awe of the ginormous stone and marble instruments, which make absolutely no sense until your guide starts to point things out and explain what they mean. The instruments measure time, eclispse and track the constellations but I am most fascinated by what is one of the world’s largest sundial, and its accuracy is astounding.